A documentary made by the brother of the singer of the famous band The National. A lot of my friends were raving about this film but unfortunately I didn’t really like it. It was basically about how the brother of The National singer hasn’t had much luck in life and suffers from being the non-famous sibling. He gets an opportunity to go on tour with the band as a roadie and decides to film a documentary about the band at the same time. It quickly turns out that he messes up his roadie job (he can’t even get simple tasks right) and also doesn’t know which direction his documentary is going. He also behaves like a total idiot most of the time and annoys the band with his silly behaviour and lack of professionalism and focus. The band members almost come across as very patient babysitters who are doing this poor guy a favour. The film ultimately turns out to be about himself and how he finds his way in life (or not) and how he copes with his failures. The popular TV teenage boys (now early twens, I assume) are back and the film was as expected – full of slapstick, absolutely cringe-worthy but really good fun. I laughed a lot. Luckily I didn’t have very high expectations and I think that’s why I ended up enjoying it. In this film the four guys go to Australia to take a break from their boring university lives and of course behave completely inappropriately in any given situation. The highlight for me was when Will goes on a massive rant about middle class backpackers and puts them all in their place. Hilarious! I’ve had this book on my Kindle for over a year now – unread. So when I saw that this film came out, I thought “Great! I don’t need to read the book anymore!”. 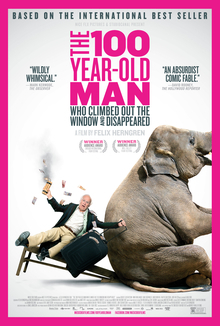 The title pretty much summarises the plot – the man disappears from an old people’s home and meets all sorts of people and gets into all sorts of situations, some of them dangerous. But he always handles things with a kind of naïve but logical approach and without any fear. At the same time we learn about his life, a story with a lot of unusual twists. Quite entertaining. The film was in Swedish with English subtitles. It still sometimes catches me by surprise when mainstream films in the cinema aren’t dubbed. I’m so used to everything being dubbed in Germany.